W.J. Rowe Transfer hauling coal, Nome Alaska, 7 tons. W.J. 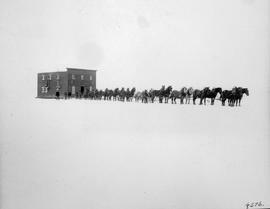 Rowe Transfer moving house with twenty-horse teams; Nome Alaska. Weigh bill for the Northern Pacific Railroad. Weigh bill for the Oregon Railway and Navigation Co. Weigh bill from the Steamer Alida. West landing, Takla Lake; Manson Creek Trail ferry. 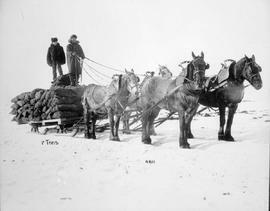 Winter mail carriers on the Grand Trunk Pacific railway grade. Yukon dog team freighting through the canyon; Alaska. Yukon telegraph trail, Bulkley Valley. Footage. Depicts the transportation of a "turbine runner" for the Mica dam from the Vancouver docks to the dam site (via CP Rail flatcar to Revelstoke, truck to the Columbia River, and barge to Mica). The item consists of unedited footage. It depicts disassembly and transport of a Sikorsky S-55 helicopter to the Northwest Territories; its reassembly; and aerial views from helicopter during the "Franklin Project." The item consists of unedited footage. It shows a Sikorsky S-58 assists in the placement of a microwave tower on a mountain top. Footage. Shows Neal Evans Transportation Company vehicles, airplanes and activities. The item consists of unedited footage. It shows a Sikorsky S-58 as it attempts to set up two 3000-pound poles and a cross-bar. The S-58's designation is "CF-OKS".